Personal Appearances - The Fun Never Ends! Cow Milking our Specialty... well almost. Ahhhh....and we thought the fun would never end. 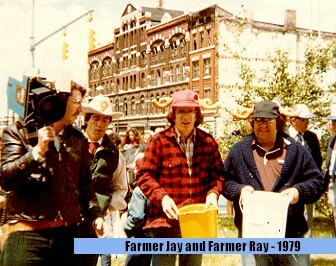 1979 - Downtown Syracuse Farmer's Market with WHEN's PM Driver, Jay Flannery and Mid-day man, Ray Diorio. Two unidentified Channel 9 employees are pictured at left. 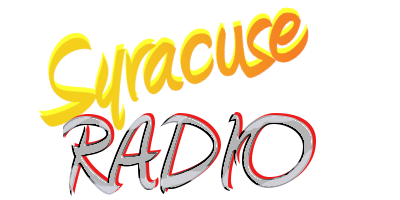 Often radio stations are called upon to supply their personalities for various promotional functions. Syracuse's Downtown Farmer's Market is an annual event... and in 1979, two champion (?) cow milkers were recruited (drafted) from the WHEN airstaff for an appearance. The late Ray Diorio, who at the time held down the highly rated mid-day slot, also enlisted the assistance of farmboy and PM driver, Jay Flannery, in their quest to bring sanity back to cow milking in downtown Syracuse. At the behest of station manager, Bob Carolin, our "boys" took to the streets in special protective headgear supplied for the sole purpose of making their respective cows more cooperative, productive and r-e-l-a-x-e-d. Look close and you'll see. Our good ol' boys, dressed to the 9's were now "farm-ready." They'd give it a shot...and what a shot it was. They cooed, they prodded. They pulled. They cajoled. But.... after all was said and done... more, of course, was said ... than ever done. " Look in the bucket boys", screamed one incensed farmer. You guys better get back to the barn!" On being interviewed immediately after the event, the wildly popular milking duo of Diorio and Flannery conceded they had been confused by the somewhat complex rules and thought the judges were looking for quality and agricultural style.... not quantity. The moral to the story: Next time invite Phil Markert. Bigger, softer, gentler and...warmer hands... even plays the piano. Eeeewwwwhhhh... Fly me to the moooooooo n.